Put the pedal to the medal… oh wait… never mind… no pedals. Either way, you get the point. If you did have pedals on your bike, however, the Dainese 2015 Collection would have the shoes that would become well acquainted with your accelerator pedal. 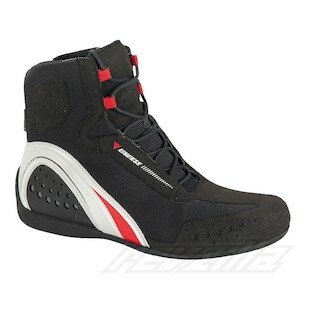 Moving into the realm of sport technical shoes, the new Dainese Motorshoe D-WP Boots are a CE-Cat. 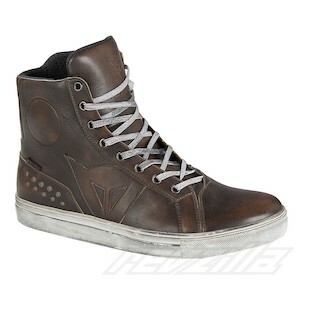 II-rated shoe that retains a high level of comfort and street style either on or off the bike. Waterproof to just below the red laces, these shoes make use of control inserts on the inner ankle and heel as well as a Skywalk Sole, protectors at the heel and ankle, and a reinforced toebox. Constructed out of a high-tenacity polyamide fabric and suede microfiber, the construction offers both moto-functionality and relaxed style all in one. If you are looking for a somewhat different style, the Dainese Street Rocker D-WP Boots are also coming new for Fall of 2014. As another CE - Cat. II-certified riding shoe, you will have moto-inspired protection in the full-grain cowhide leather upper and rigid inserts at the ankle. Slightly more rigid than the aforementioned Motoshoe, these also have an edgy, clean style without being obtrusively funky. Who wants pedals anyway? That is just silly. So the next time you are looking for a comfortable and stylish pair of riding shoes that are still highly functional on the motorcycle, Dainese has the gear for you!